AVALON — Scuba divers and snorkelers who enjoy exploring Catalina Island’s crystal blue waters are encouraged to spend a day diving in local waters during Chamber Day on May 1. This year mark’s the event’s 25th anniversary. The day of diving is dedicated to raising funds for the University of Southern California Catalina Hyperbaric Chamber. Chamber Day and Chamber Eve were begun in 1989 by Roger Hess, former owner of Charisma Charters. Close to 200 divers attended the initial event and raised $15,000 for the hyperbaric chamber. Since then, the event has attracted more than 1,000 participants — and just last year, it netted more than $136,000. Kurtis hopes this year’s donations surpass 2012’s. Chamber Day includes a full day of diving at Catalina Island and a walking tour of the hyperbaric chamber. The cost is $95 (plus $30 for food and airfills, which goes to the boat). That includes two dives, the tour, a T-shirt, and five daytime raffle tickets. Participating boats include Cee Ray, Giant Stride, Hattitude, Magician, Pacific Star, Riviera, Sand Dollar, Sea Bass, Second Stage, Sundiver, Sundiver Express, Sundiver II and Westbound. 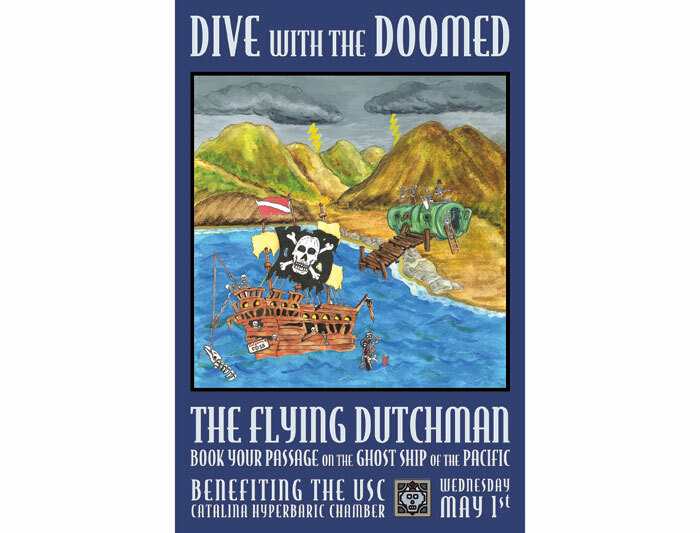 For those who can’t take the day off but would still like to donate to the cause, a Flying Dutchman option includes five daytime raffle tickets and a special limited-edition T-shirt. There’s also the Chamber Challenge, which “challenges” the diving community to raise funds for the chamber through direct donations. Chamber Evening — Chamber Eve 2013 — wraps up the day with a sit-down dinner in the Aquarium of the Pacific’s Great Hall in Long Beach. Co-sponsored by the Aquarium of the Pacific, the event will allow guests to dine under a life-size model of a blue whale, participate in a raffle, listen to speeches and witness the presentation of the Chamber Day 25 check to the director of the USC Catalina Hyperbaric Chamber, Karl Huggins. Catalina’s hyperbaric chamber is the only facility in Southern California dedicated solely to the treatment of diving accidents — 365 days a year, 24 hours a day, seven days a week. The chamber provides divers with a vital safety net when something goes wrong. Chamber Day provides more than 50 percent of the chamber’s annual budget. Everyone who donates $250 or more toward the event will receive a framed 25th anniversary poster, which features every Chamber Day logo from 1989 to 2013. For more information, visit chamberday.org, call (310) 652-4990 or “like” the USC Catalina Hyperbaric Chamber Facebook page.